A man in France has regained some degree of consciousness after being in a vegetative state for 15 years. Doctors treated the 35-year-old, injured in a car accident, with an experimental therapy that involved implanting a nerve stimulator into his chest. Within a month, he could respond to simple instructions, turning his head and following an object with his eyes. Experts say the results are potentially very exciting, but need repeating. 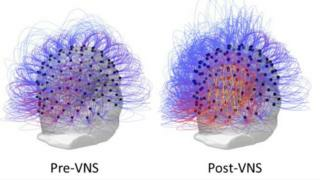 Vagal nerve stimulation (VNS) may not work as effectively in patients with different patterns of brain damage. But Angela Sirigu, from the Institut des Sciences Cognitives Marc Jeannerod, in Lyon, said it had chosen a really challenging patient to test the treatment. The vagus nerve connects the brain to many parts of the body and helps control automatic or subconscious functions, including alertness and wakefulness. After one month of vagal nerve stimulation, the patient's mother reported he had an improved ability to stay awake when listening to his therapist reading a book. And brain scans reflected this improvement, Current Biology journal reports. He also started responding to "threat". For instance, when the doctor's head suddenly approached the patient's face, he reacted with surprise, opening his eyes wide. Ms Sirigu said: "Brain plasticity and brain repair are still possible even when hope seems to have vanished. "After this case report, we should consider testing larger populations of patients. "This treatment can be important for minimally conscious patients by giving them more chances to communicate with the external world." Dr Vladimir Litvak, from The Wellcome Centre for Human Neuroimaging, at University College London's Institute of Neurology, said: "This might be an interesting new lead, but I would suggest to be cautious about these results until they are reproduced in more patients. "It is hard to know based on a single case how likely this treatment is to work in the general patient population."